Neptunium is a silvery metallic element named after the planet Neptune. The first synthetic transuranium element of the actinide series, neptunium was discovered by E. McMillan and P.H. Abelson in 1940 by bombarding uranium with slow-moving neutrons. While neptunium is naturally found in only minute quantities as decay products of transmutation reactions in uranium ores, this ductile element can be extracted in kilogram quantities from nuclear reactors. 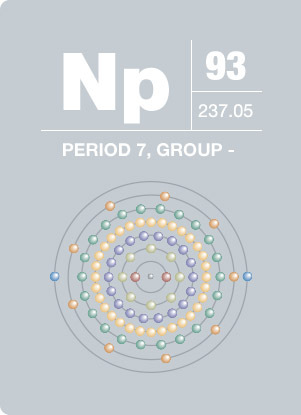 237Np, the most stable of 17 isotopic forms, can be used as a component in neutron detection instruments.